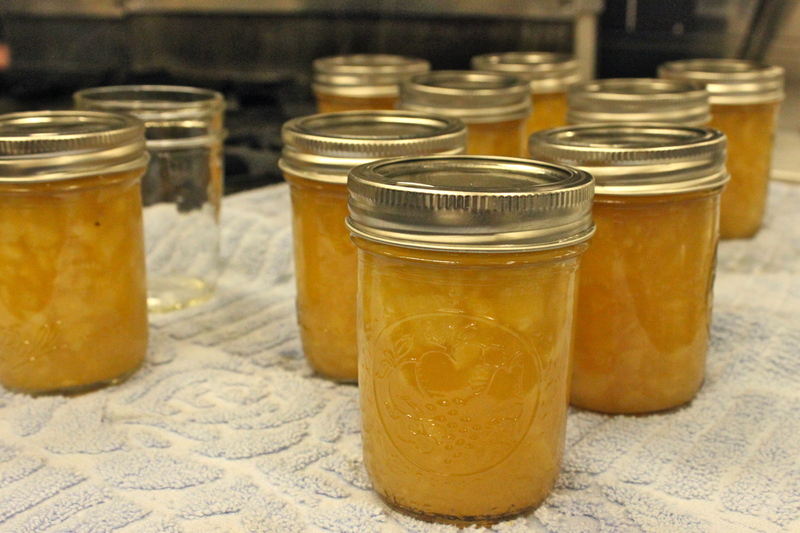 On a freezing October night, while we slowly watched the cold rain turn into snow, a little group of food enthusiasts and Gastronomy students gathered with Allison Carroll Duffy to learn more about canning jellies, jams and marmalades. While some of us were canning for the first time and others were frequent jelly-makers, nobody knew more about the art of preserving food than Duffy, a Gastronomy program graduate and certified Master Food Preserver. A teacher, writer and proud mother of two, Duffy’s sweet and nurturing personality suits her homey love of canning and preserving perfectly. After providing tons of useful tips and basic tricks of the art of preparing food for canning, as well as providing resources for future study and recipes (posted at the end of this entry), we were given the opportunity to create one of her own recipes: pear-ginger jam. We were put to work in the kitchen, peeling, chopping, mashing and cooking, following the simple recipe from start to finish. And as someone who had absolutely no experience with canning, this workshop proved to me that it’s not nearly as complicated or challenging as it first appears. Even if you’re like me and have never tried creating jam before, give this recipe a shot. The equipment is inexpensive and there are many kits available to get you started, including the Ball Utensil Kit and canning pot with rack, both recommended and used by Duffy. Note: this recipe requires 1 package of Pomona’s Universal Pectin, available at Whole Foods and other natural food stores. The pectin box will contain two packets – one packet containing tan-colored pectin powder, and one smaller packet of white-colored calcium powder. For the ingredients listed below, follow the directions contained within the box. Before beginning, wash and rinse pint jars, lids, and screw bands. Set screw bands aside until ready to use. Place jars in hot water bath canner, fill at least 2/3 of the way full with water, and bring to a boil. Sterilize jars for 10 minutes, then turn down heat and let jars stand in hot water until ready to use. Place lids in water in a small pan, bring to a low simmer, and hold there until ready to use. In a large sauce pan, combine mashed pears with grated ginger, lemon juice and calcium water. In a separate bowl, combine sugar and pectin powder. Bring pear mixture to a boil, then add sugar mixture and stir vigorously for 1-2 minutes to dissolve the pectin. Allow mixture to come back to a boil, then remove from heat. Remove hot jars from canner and fill jars with jam, leaving 1/4 inch of headspace. Remove trapped air bubbles, wipe rims with a damp cloth, and put on lids and screw bands finger-tight. Place jars back in the canner, cover with lid, return to a rolling boil, and boil for 10 minutes. (Add 1 minute additional processing time for every 1000 feet above sea level.) Turn off heat and allow canner and jars to sit for 5 minutes. Then remove jars from canner and allow to cool undisturbed for 12-24 hours. Confirm that jars have sealed before storing in a cool, dry place. Sealed jars have a shelf life of 1 year, and once opened, jam should last for about 2 weeks, refrigerated. Want even more? Check out Duffy’s website, CanningCraft, filled with tips, recipes and ideas, and explore some of her favorite links on home canning and food preservation. Thanks for the nice post about the class, Meg! It was great to meet you, and hopefully I’ll be able to teach another class at BU sometime next year, if folks are interested! Pingback: CanningCraft » Back at BU…for a bit of Canning!